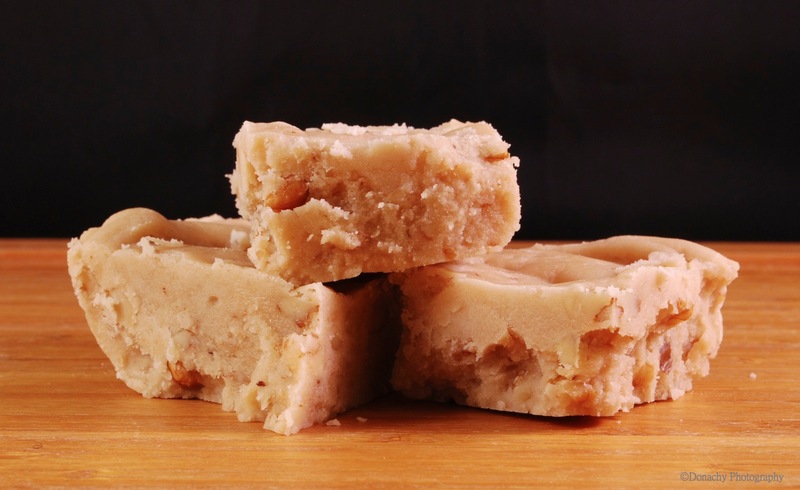 These maple walnut fudge squares were made from an especially rich, dark grade-A syrup. Line an 8 inch square pan with nonstick foil and spray with cooking spray. Combine syrup, sugar, heavy cream and salt in a medium saucepan, preferably a non stick one; bring to boiling over medium high heat, stirring constantly. Once boiling, cook 7 to 8 minutes or until mixture registers 238 degrees F on a candy thermometer. Remove pan from heat. With an electric mixer, beat in butter and vanilla. Continue to beat on high power for 8 to 9 minutes, or until thickened, light in color and fudge loses its glossy finish. Stir in nuts and spread in prepared pan. Let stand until firm about 25 minutes, then cut into squares. This recipe seems to be just what I was looking for! Should the butter be added cold or room temperature or it doesn’t it matter? Thanks! It doesn’t really matter since the butter will melt immediately. I tend to use butter that I’ve already melted since I store it in the freezer.